Thank you illuminated soul for bringing so much joy to me. Thank you for the total acceptance that is between us and as such it’s allowing you to think, feel, grow and change your mind. It’s an undefinable freedom – one that no one can ever give you, yet one that you just need to give yourself permission to experience. Dear illuminated soul, you are so unique in being you. You are an onion: layers and layers of your experiences– each adding up to the total that is you at this very point in time. The theories describing the meaning of life cannot ever capture the experience of our experience. Life cannot be lived via theories, judgement or build on external expectations. Life is found in the love that can no longer be contained in our hearts, one which spills out into the world that is around us. This love does not look for glory, recognitions because it just is. This is the love that changes without forcing, without expectations. There is no reward that is recognised by the external world, but there is that feeling inside which was once was felt so often when you were a child but one that has been missing for so long. It’s the feeling of doing the right thing, because pure love is always right and innocent. It’s not a feeling of achievement or convenience, but it’s a feeling that once again all is well with the world. Can there ever be a more spectacular feeling than the recognition that all is well with the world? Dear illuminated soul, thank you for accepting me as I am. Thank you for wanting to see me do life in front of you, thank you for not having any expectations. The gift of your open heart and your inner joy brings a beginning into our each and every moment. Seeing you be you, allows the dividing walls of then and now to be no more. 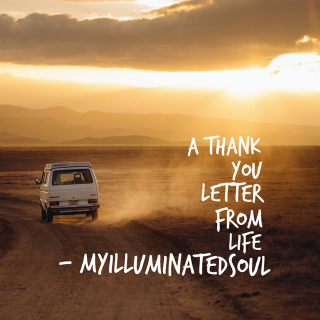 Dear illuminated soul, thank you for allowing me to see you, as you are – your pains, sorrows, joy and uncertainties. Thank you for sharing and for not wanting advice for I have so little to offer. Thank you for living life on your own terms and not expecting others to be the answer. Go on, live life, enjoy the adventure.